Red Lobster is known for their delicious tartar sauce, but it is hard to get some extra to go. You can make some copycat Red Lobster tartar sauce at home. Do you love the Red Lobster tartar sauce? It is full of white onions, chopped carrots, and sweet pickle relish. 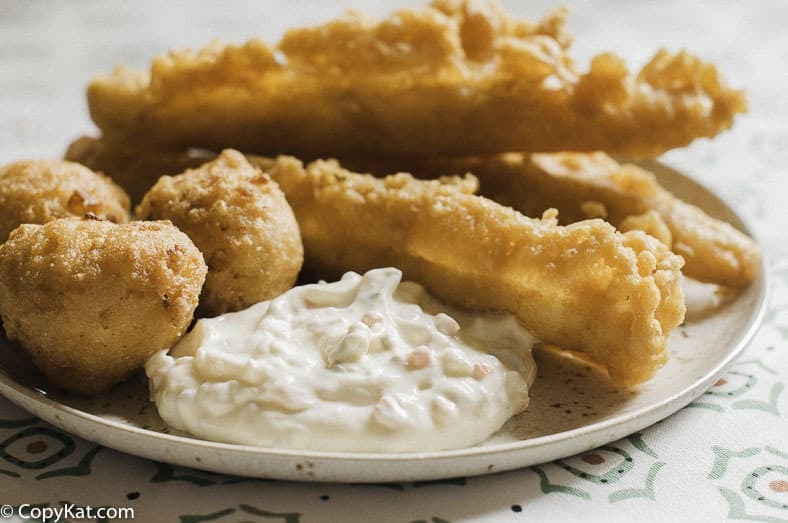 You won’t miss out on this delicious tartar sauce when you make it at home. Have you ever been to the Red Lobster and wished you could take home some of this delicious Red Lobster Tartar sauce? Now you don’t have to ask for an off the menu item, you can make it at home for yourself. You might wonder what is in this recipe, it is very simple, you can use mayonnaise, chopped white onion, pickle relish, and chopped carrots. This combination together makes for a slightly sweet tartar sauce that is has a nice crunch to it. The carrot adds a nice texture to the tartar sauce that you are going to love. Tartar sauce is so wonderfully diverse. The Red Lobster tartar sauce tastes wonderful with fried fish, baked fish, and it even tastes wonderful on a hamburger. Love the Red Lobster? You may enjoy these favorites. You can recreate the classic Red Lobster Tartar sauce at home. In a small bowl combine all ingredients. It is best if you store this sauce in the refrigerator for about 30 minutes before serving. You can keep this for 7 days in the refrigerator. Been going to RL for years. Our first date was there. We’ll soon be married 45 yrs. I’ve been making my version of RL tartar sauce for years but didn’t think of adding sugar. And why did you say not to use dill relish? Does it ruin the flavor because of sugar in recipe? Dill relish has a different flavor than what is needed in this recipe. Don’t get me wrong, I love dill relish, but I think it isn’t what is needed to get the flavor just right. I have looked for a recipe for RL’s tartar sauce unsuccessfully and stumbled across yours. I am looking forward to trying it. I am surprised there is no lemon juice in this. I may add that after trying this. Thanks for the recipe! Print Recipe button doesn’t work as expected. Why? I like the recipe, with some slight modifications. The onions can overwhelm the taste. I cut the amount onions in half, made the mayo 1/3 cup, added an extra 1/3 cup of relish and doubled the carrots. I eat Red lobster quite frequent. In our area, they sell the tartar sauce by the pint. However, since I travel a lot its good to now have their tartar sauce recipe. Never having had Red Lobster tarter sauce, I cannot comment. But….have you had the Lubys tarter sauce? If you could recreate, I would be in heaven. It would go so well with your LJS beer battered fish! That is just the best tarter sauce ever. Keep up the great work! Just discovered this site, it’s got some great ideas! I love the Luby’s tartar sauce. I may have to add that one in. I hate that they just removed the lemon pepper baked fish though! I loved Red Lobster’s tartar sauce. I tried making it on my own but couldn’t figure it out. The secret is sugar! Who wpuld have thought. Thank you. I will make it this way from now on. I have opened every link on this page, it just takes me back to this page…..where is the recipe? Is it just mayo, carrots and sweet relish? What are the quantities? if you click on the 13 Red Lobster Recipes you will find the tarter sauce recipe there. I am sorry I had a glitch, the recipe is back now. 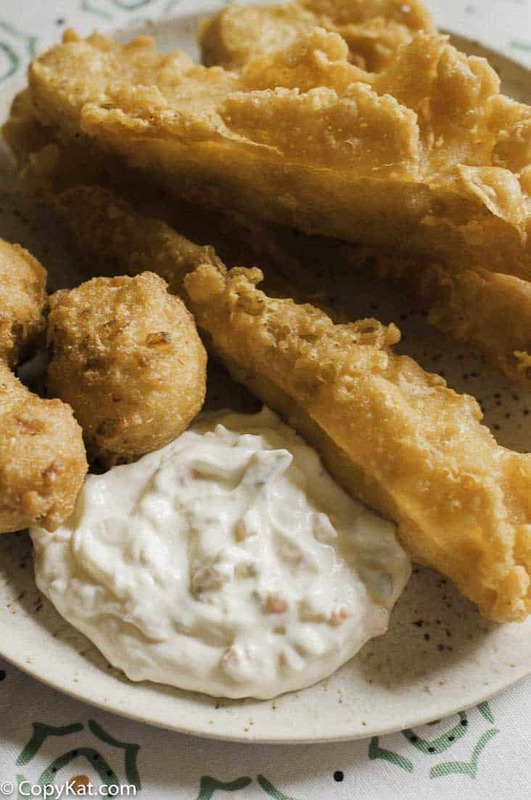 Now that we have the tartar sauce recipe, how about a recipe for the Samuel Adams beer battered fish? PLEASE! I will keep your suggestion in mind! I bet that is tasty! I have to confess that my family is not big fish eaters so tarter sauce is not something we have… but my sister would love this recipe and I plan on sending her a link to this blog post. Copycat recipes are wonderful. My mom loves that Red Lobster tartar sauce so much. I’ll most definitely be surprising her with this. Thanks! i do enjoy their tatar sauce but i really love their cheddar biscuits. I could live off those alone. I love Red Lobster and love their tarter sauce too. I really enjoy making condiments at home, so I will have to try this recipe. I have never put carrots or sugar in my tarter sauce recipe before. Now I know the secret! Not a huge tarter sauce person so I don’t think i have ever tried red Lobster’s. Though I love copycat recipes because it makes it less painful to stay on a budget and eat at home! I don’t believe I’ve ever put tarter sauce on a hamburger before but I’m willing to give it a try! We haven’t been to Red Lobster in a while. Now I want to go and yes, I’ll have their tarter sauce with my shrimp and fish! I’m saving your recipe to try at home.